Tamoura Hayes invited a friend to go with her to the senior prom. Tamoura started her high school career as a shy freshman, but says she came out of her shell and developed self-confidence. She was voted homecoming queen. Whenever the one-note, mechanical “bing” would sound, Tamoura Hayes’ nerves began to unravel. Around her, the hallway would quickly fill up, turning into Lake Michigan on a stormy day, loud and thrashing. In the fall of 2007, Tamoura was a quiet 14-year-old freshman at Marshall High. Every time she moved from one class to the next, she did her best to avert her eyes from anyone and just blend in. Often, she had to duck around fights or avoid bullies. She didn’t tell anyone about the dread she felt. Today, Tamoura is 18 and can laugh about it. Tamoura and her class—the Class of 2011—began and finished high school as the district debuted first one, then another grand experiment to improve Marshall and other struggling schools. Freshman year brought “High School Transformation,” an initiative in which at least $80 million was spent districtwide on new curricula and instructional coaches. As Tamoura and her classmates embarked on their senior year in fall 2010, Marshall became a turnaround school, starting over from scratch. Curricula changed, again. The school got a new principal, again—the third in four years. The staff changed, again, as every teacher, administrator, janitor, security guard and whoever else worked at Marshall had to reapply for his or her job. For decades, Marshall has been known for two things: its winning girls’ basketball team and its standing as one of the lowest-achieving high schools in the city. The turnaround is, perhaps, a last-ditch effort to change the latter legacy. The odds were not good for Tamoura and the rest of her class. They were more likely to drop out than graduate, and they had a dismal chance of scoring above a 20 on the ACT, the score needed to get into a minimally selective college. The year Tamoura was a freshman, only two seniors reached that benchmark. In some ways, Marshall and the other perennially failing high schools in Chicago are like Afghanistan—a place where many wars, against poor academics and high dropout rates, have been started but never won. The evidence of these lost battles isn’t just in low test scores. The school attracts few high-achieving students, so few they can be counted on one hand. One measure of whether the turnaround initiative is worth the substantial investment of taxpayer money will be whether Marshall attracts students who are ready for accelerated classes, or even regular high school-level courses. Over the years, Marshall has vacillated between offering and scrapping an honors track for better students. From 2001 to 2008, the school had one or two Advanced Placement classes a year. But only two students out of 441 earned a 3 or more on the AP exam, the score needed to earn college credit. Since 2008, AP classes have disappeared. Yet the vision for teaching and learning at Marshall is less clearly defined than the more immediate goals for improving the school’s culture and climate. In the turnaround’s first year, much of what went on in the classrooms was up to the teacher, with two exceptions. First, every day, in every subject area, teachers were required to present an exercise to prepare students for the ACT. Second, student-level data from regular assessments were to be used to help teachers understand what they needed to re-teach. As the end of the school year approached, Assistant Principal Matt Curtis kicked off a process to create a uniform list of skills that every teacher would cover. But the process was difficult. Teachers and administrators struggled to accept the idea that they should have challenging curricula, even though most students were working below grade level. At first, there was little talk about students performing on grade level or above. Melissa Roderick, a University of Chicago professor and senior director of the University of Chicago Consortium on School Research, says that many high school reform initiatives focus all their attention on the students who aren’t ready for high school. “What are you doing about all the smart kids?” says Roderick, the principal investigator for the Network for College Success. The network, a program of the university’s School of Social Service Administration, helps high schools come up with systematic strategies to increase students’ college-preparedness. That Marshall High School is not and has not been a destination for the super-studious was not lost on Tamoura her freshman year. Tamoura, who had a round, baby face, showed up on her first day of high school with her hair done, her maroon polo shirt ironed and the new shoes she’d saved up to buy spotless. But her excitement was squashed by chaos. Unlike Tamoura, few students had bothered to come to orientation and get their class schedules in advance. Counselors buzzed around the sweltering auditorium the first day of school, creating schedules and handing them out to waiting students. Tamoura was bewildered by the empty classrooms. At the time, she talked about her dreams—but even then she doubted that the school could help her accomplish them. She went on to say that she was “not even supposed to be here.” Her first choice was Providence St. Mel, a West Side private school with a strong reputation for getting students into college. Her family couldn’t afford it. Her second choice was Al Raby, then a relatively new, small CPS high school. She wasn’t offered a spot in the school. Tamoura knew about the city’s elite selective enrollment high schools, but her grades and test scores weren’t high enough. She admitted she didn’t do particularly well at Beidler Elementary, and said “that was half my fault and half my teachers’ fault.” More than two-thirds of her 8th-grade class was not performing at grade level. Tamoura was not in good shape emotionally either. At the end of 7th grade, when Tamoura was 13, her mother died unexpectedly of heart problems. In the end, when it came to figuring out high school, Marshall was the only option. Like many students at Marshall, Tamoura has deep roots there. Her father, Tyronne Hayes, played basketball for the school in the mid- to late-1980s and now works as a security guard, standing watch on a corner of the third floor. He met Tamoura’s mother there, and her mother gave birth to their first child when she was still a student. Tamoura is the baby of the family, and her sister and two brothers also went to Marshall. At the onset of Tamoura’s freshman year, the promises of High School Transformation brought excitement. Experts had spent a long time researching and vetting curricula that was supposed to be especially good for bringing students who are behind up to speed. The Bill & Melinda Gates Foundation had put its weight behind the effort, and there was money for resources that Marshall had lacked for years. Carts heavy with laptop computers came rolling into classrooms. Science labs were stocked full of equipment. English classes had piles of paperback books so new that the covers cracked when opened. Teachers, too, were enthusiastic. And Principal Juan Gardner had a full-time mentor, a man who had success running Lane Tech, one of the city’s top high schools. Halfway through Tamoura’s freshmen year, she and 28 of her peers got plucked to be in an honors track—the first one the school had had in years. Gardner said he thought of it as an investment in the school’s future. But the initiative never gained a strong foothold. Attendance was atrocious, with half the students missing on any given day. Teachers complained that some of the lessons were project-based, difficult to teach when the mix of students changed on a daily basis. Gardner, who by most accounts was a hands-on leader who connected well with students, left after he got entangled in a scandal involving the girls’ and boys’ basketball coaches. The leader of High School Transformation left the district. Officials changed the name: No longer would it be described in ambitious, far-reaching terms. Instead, it was simply called IDS, for Instructional Development Systems. Then Arne Duncan, the CEO who had spearheaded the strategy, went to Washington D.C., to become secretary of education, and support dwindled. CPS administrators have already announced they will no longer evaluate IDS next year, effectively putting it to rest. The district and other stakeholders hope the turnaround effort doesn’t suffer the same fate. But one example illustrates that the strategy isn’t foolproof. In 2008, Orr became the first turnaround high school when CPS turned management over to the Academy for Urban School Leadership, which brought in a superstar principal, Jammie Poole, from Memphis. Within a year, newspapers, including the New York Times, wrote glowing accounts of the new leadership and improved school climate. But academic achievement never rose significantly. In the middle of last year, AUSL got rid of Poole and brought in an entirely new management team. From Day One, Tamoura found high school relatively easy. The High School Transformation curricula were supposed to be rigorous, but Tamoura says she never worked particularly hard and never received any grade below a C.
In her sophomore year, Tamoura joined cheerleading, debate and the allied health program. She started coming out of her shell, saying she risked letting people see a little more of her personality, which she describes as “goofy, fun, energetic.” And “a little weird”—Tamoura says she loves pop singer Katy Perry, while most of her classmates are into rap star Lil Wayne. At the end of Tamoura’s sophomore year, Gardner left and was replaced by Sean Clayton, a principal from a small elementary school that sends a lot of students to Marshall. Most teachers and students say that Clayton and his team never got a handle on discipline or teaching and learning. Tamoura, who got along well with Gardner, says she and others didn’t connect with Clayton. That year, the honors track stopped, although there were still some accelerated classes. Tamoura says she was frustrated that there was little recognition for students who were doing well. In January 2010, the district announced that the school would become a turnaround. Tamoura and her friends, about to embark on their senior year, were immediately worried. Would their favorite teachers be gone? How would the new teachers be? Eleven teachers were hired back. The senior counselor and several of the security guards, including Tamoura’s dad, kept their jobs. Tamoura was happily surprised by the changes she saw when she came to school last September. A lot of the students who caused trouble were gone. “The clowns who do their work are still here,” she said then. Tamoura especially fell in love with art and the art teacher, Annalizza Chan. In other classes, the work also was more challenging. “We get homework every day from at least two or three of the teachers,” she said in November. During her first three years of high school, she had only 10 to 15 minutes of homework a day, so little she could get it done between classes. But students also struggled with some of the new academic intensity. Tamoura’s math class was taught by Tyler Meeks, who came to Marshall from his first teaching job: working with over-age 8th-graders at Crane, another tough high school. Tamoura and her classmates call it pre-calculus, but the actual name is “discrete math,” defined as a class in which problems are simply stated so that few prerequisites are needed. One day in mid-December, the students were taking a test and struggling with 23B, a division problem with functions. “This is a brain-buster,” said one. “I need help,” another said. “Why are you giving this to us, man?” Tamoura commented. Meeks finally tells the class to cross the problem out and move on. They continue to moan and groan. “I am so lost,” Tamoura says. Exasperated, Meeks finally tells the students to hand up their answer sheet. Even though it’s a test, he will go over the questions. “I pray I don’t get this in college,” Tamoura says out loud to no one in particular, as Meeks writes the problem on the chalkboard. Later in the year, Tamoura notes that she was a bit discouraged in the summer between her junior and senior year when she went to an enrichment program at the University of Illinois at Chicago. The other participants were from high schools across the city, including one of the top schools, Whitney Young. Most of the rising seniors had already taken subjects like calculus, but she hadn’t even taken pre-calculus yet. In high-achieving schools, that would be the norm. At the beginning of the 2010-2011 school year, Assistant Principal Matt Curtis did not force teachers to adopt any prescribed curricula. Instead, he insisted that teachers be aware of what’s on the ACT and make sure that students are prepared for it. Curtis fundamentally believes that he can improve academics at Marshall by closely monitoring data, seeing how performance changes class by class, teacher by teacher. When teachers stop by his office, he’s quick to show them a spreadsheet showing where their students are lagging. He then presses them about what they can do differently. The legs are skills, content and technique. The seat is student achievement. The floor is classroom management. The difficulty in developing curricula for a school like Marshall is evident when Curtis attempts to kick off the process. At an English department meeting in early May, teachers are trying to determine the eight skills students should be taught in each grade. “We need to be explicit: What should a student be able to do?” Curtis says. Immediately, he gets push-back. Eight skills, says freshman English teacher Fadia Afenah, seems ridiculously too few, considering students need so many. And getting one skill down might take the re-teaching of others, and that can take a while. “It’s one thing to say students should know how to dissect a sentence, but be aware that means starting with lessons about nouns and adjectives,” Afenah says. She spent the first few weeks of the year reviewing the basics with her students, such as the difference between common and proper nouns. Some students seemed bored, but others needed the review. Curtis pushes back. Don’t think of the steps that get you to the end skill, think of the end skill, he says. “I am not saying you are wrong, but the ACT tests higher-order thinking skills, and we need to outline the skills we must teach to get there,” Curtis insists. The chair of the English department, Alison Dodson, suggests they give Curtis eight skills, but also come up with 16 to 19 that they will “at least dip their toe into” during the year. The teachers split into small groups and start talking. He tells them they will be working on this all summer. Eventually, Curtis wants his cadre of enthusiastic young teachers to be so adept at teaching that high-performing students will trust that they can get what they need from Marshall. That goal has yet to materialize. Last year, 20 students who tested high enough to be put in honors classes were projected to enroll, but only four showed up. This year, the administration decided it wasn’t worth the effort to schedule an honors track for the freshmen, says Matthew Olsen, the school’s programmer. Instead, the hope is that teachers can differentiate instruction and challenge the students who can do accelerated work. Tamoura says she thinks one of the biggest problems at Marshall has been the lack of recognition and places to shine for more studious students. Courses never went beyond the now-shuttered honors classes, since Advanced Placement disappeared. “Those AP classes could be used to get college credit,” Tamoura points out. By mid-May, Tamoura at least knows she’s headed to college. Tyronne Hayes is delighted to report that while his baby girl didn’t get into Spellman, she was accepted to Clark-Atlanta University and St. Cloud State University in Minnesota. Hayes recalls that Tamoura was born prematurely—only three pounds—suffered breathing problems for the first few years and then lost her mom at a young age. “All those odds were against her,” Hayes says. But Tamoura’s focus even convinced Hayes to go back to school himself. He enrolled in some online courses toward a college degree. “I want to be able to say, ‘I got mine too,’” he says. At the moment, Hayes is not exactly sure how he will pay for Clark-Atlanta, where tuition is about $19,000 and a dorm room and meal plan cost an additional $9,000. Paying all the costs out of pocket would eat up virtually his entire year’s salary. Hayes says they are hoping and praying that a few more scholarships will come through. Tamoura got a nice financial aid package, but still needs about $7,000. Hayes says he hopes to stay at Marshall for 10 more years and see the school, and the community, evolve. Many people are trying to bring the school back to its glory days. “It is cool,” he says. Meanwhile, Tamoura emerges from a classroom wearing a tiara. Hayes explains that it is her birthday, and that her friends are planning a party. Tamoura is proud of the personal progress she’s made since freshman year. “I felt like I was a nobody. 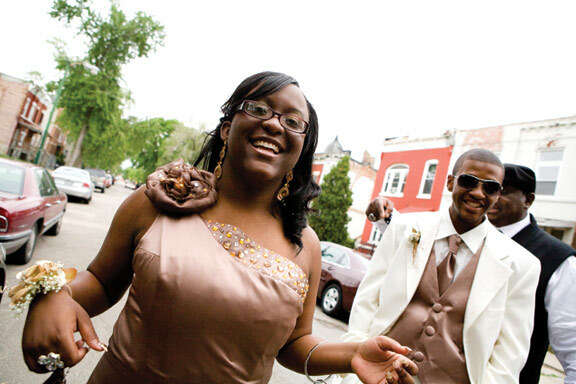 I had no self-esteem.” Things are much different now—Tamoura was selected as homecoming queen. “That really, really boosted my self-esteem,” she says. Tamoura and her seven best girlfriends walk down to lunch and stake claim to a round table in the cafeteria. After they sing “Happy Birthday,” they smear hot-pink frosting from cupcakes on Tamoura’s face. Eventually she wipes it off, but for the rest of the day, it leaves a pink glow on her brown skin. As she has become a young woman, Tamoura’s face has thinned out and it is no longer the round and cherubic baby face, but regal. When only a few cupcakes are left, the girls decide to give one to Principal Kenyatta Stansberry. They head down the hallway with an air of purpose and ownership. Tamoura leads the way. Since their freshman year, the young women have seen two principals come and go and virtually an entire cadre of teachers replaced. Of the 349 students who enrolled with them, about 140 will walk across the stage with the girls in June. So far, experts haven’t figured out how to capitalize on the strengths these young women, and others like them, bring to school. They may not have top test scores, but they are earnest, motivated and intelligent students who, for one reason or another, wind up in neighborhood high schools that are still trying to find a formula for academic success. Two of Tamoura’s friends are going to Rockford Community College, one to Howard and one plans to join the Navy. One will go to Northeastern University on the North Side, a choice she made because she had a low ACT score and because she can get help taking care of her eight-month-old baby boy from family in Chicago. Another will go to Western Illinois in Macomb, though she will be on probation because she didn’t quite meet the criteria for admission. By mid-August, Tamoura abandons her plans to go to Clark-Atlanta University, the college she once called the school of her dreams. Instead, she decided to go to Western Illinois. “It is cheaper and closer to home,” she says. But still, she’ll be the first in her family to go away. No, things didn’t turn out so bad for Tamoura and her friends. But, no doubt, things could have been better. Tell us what you think. Leave a comment below, or email karp@catalyst-chicago.org.